If you're going to Sequoia and Kings Canyon in California, check out these things to do, which are listed in order, starting from just outside the Ash Mountain entrance near Three Rivers on CA Hwy 198. Most of the things do at Sequoia involve natural beauty. You can get out of your car and explore a cave, walk in a grove of giant trees or stroll through a meadow, climb a granite outcropping, or drive through a tree with a hole in the middle. You can also camp out and spend multiple days exploring. Mineral King: At 7,800 feet elevation, this sub-alpine valley lies at the end of a steep, narrow, winding road and is open only in the summer. It's the only part of the park's backcountry accessible by automobile, and even a short hike here is a real treat. Turn off CA 198 before you get to the Sequoia gate. In spring, beware of marmots (furry, large ground squirrels) at Mineral King. They love to chew on electrical wires and radiator hoses, making it a good idea lift your vehicle's hood and check the engine before you start it. Crystal Cave (summer only): A marble cave filled with stalactites and stalagmites, Crystal Cave is fun, but is not wheelchair user accessible. Purchase tickets for the guided tour online, at the Foothills Visitor Center or Lodgepole. Wear sturdy shoes and take a jacket. Or sign up for their Wild Cave tour for a chance to go off-trail, crawl, and climb through passageways and over steep drop-offs. Moro Rock: Standing on the top of this granite monolith feels a lot like you're on the top of the world, with the Great Western Divide laid out on one side and California's Central Valley on the other. On a clear day, you can see as far as 150 miles from here. The 400-step staircase to the summit rises 300 feet, and the altitude can make the climb seem harder than it would be at sea level, but it's well worth the trip. Allow about one hour for the round trip hike. Tunnel Tree and Auto Log: Both of these attractions are along the road to Moro Rock. Although you can't drive onto the Auto Log anymore, you and all your companions can line up across the end of it for an "I was there" photo. Tunnel Log is the only "tree you can drive through" in the area, but it's a small opening. If your vehicle is more than eight feet tall, it won't fit. Giant Forest Museum: If Moro Rock makes you feel like you're on top of the world, the Giant Forest will bring back a sense of proportion at this museum, housed in what was once a too-busy park store. General Sherman Tree: The largest among the large trees, General Sherman is the most massive tree on Earth, between 2,300 and 2,700 years old. Its biggest branch is almost seven feet in diameter. Each year it adds enough wood growth to make a 60-foot-tall tree of normal proportions. If the hike down (and back up) from the parking area is daunting, a companion can drop you off at the shuttle stop on the main road. From there, it's a gentle slope up with no steps to climb. Buck Rock Lookout (summer only): A fire lookout set atop a granite peak at 8,500 feet, Buck Rock affords unobstructed views. About 5 miles off General's Highway, southeast of Grant Grove, turn north onto Big Meadow Road, then turn left onto FS13S02 (that's a road number). You'll climb 172 metal steps suspended from the side of the rock to get in. It's open when staffed during fire season. Hume Lake: 3 miles off the main road between Grant Grove and Kings Canyon, this lake was built to supply water for a 67-mile flume that floated logs down to Sanger. Today, it's a recreation area where you can swim or rent a boat and paddle around. It's northeast of Grant Grove Village. Grant Grove: The General Grant Tree here is the world's third-largest, and is the nation's official Christmas tree. A 1/3-mile, wheelchair-accessible loop trail takes you past a settler's cabin and the Fallen Giant. The sights below are not accessible from November 1 through late May, when CA Hwy 180 is closed at the Hume Lake cutoff. 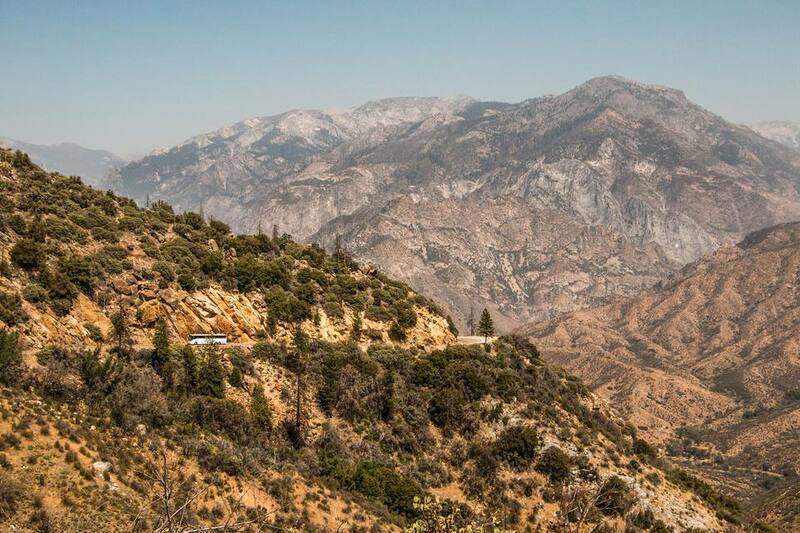 You'll find some spectacular lookout points along the drive, and Canyon View gives a good view of the distinctive, "U" shape of glacier-carved Kings Canyon. Boyden Cave: This privately-owned cavern charges an admission fee. Tours leave about once an hour. They also offer canyoneering and rappelling tours for the more adventurous. Kings Canyon: By some measurements, it's the deepest canyon in the United States, at 7,900 feet. Road's End: To cross the Sierra, you'd have to walk from here. Eighty percent of Sequoia and Kings Canyon are accessible only on foot. With 25 trailheads and 800 miles of hiking trails, there are plenty of ways to get out and see the area's unspoiled wilderness. Moro Rock: It's a 300-foot climb up 400 steps cut out of solid granite, but well worth the effort for the views you get from the top. Congress Trail: This 2-mile trail near the General Sherman Tree takes most people one to three hours to make a round trip. Crescent Meadow: Some people say naturalist John Muir called this place the "gem of the Sierra." It's about 1.5 miles east of Moro Rock, and the hike is about an hour long. Big Trees Trail: A one-hour, 1.5-mile round trip that starts near Giant Forest Museum. This trail is wheelchair user accessible. Zumwalt Meadow: A 1.5-mile, one-hour, self-guided nature trail near Cedar Grove in Kings Canyon.